is monitoring of the user activity when seeing all kind of study content. InActivity tracking just checks activity like screen touch, courser movement or press key. 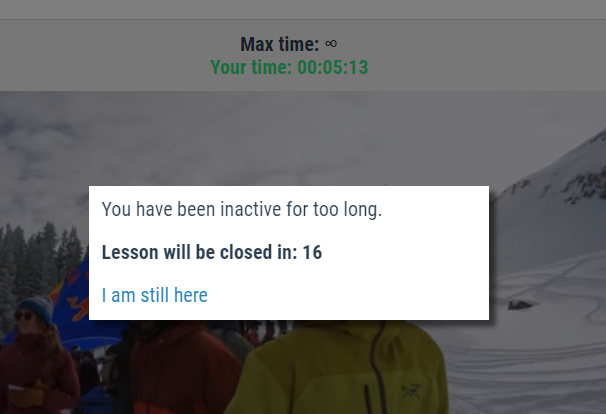 If there is no activity for 5 minutes the users gets a warning and has additional 20 seconds to make any activity. In case he does the message will disappear, in case not the lesson is closed. * to ensure users attention to the content - many of our teachers has faced the situation when their users has paid poor or no attention to the video content or Virtual Classrooms, they just left the computer or opened a different tab in the behind. The users just simply left the computer or opened in a different tab which hasn't developed required knowledge to progress in the course. This ensures that the user has spent a quality time with the content rather the only starting it. * stops the study time tracking - as the time is tracked and reported it prevents to report long time values. Remember: The lesson may also be set with the maximum study (viewing) time where if not stopped it will exhaust the time and the lesson will be marked as not completed with the parameters the your teacher has set. Edited 1 time(s). Last edit at 01/15/2019 09:03PM by Masteradmin.